Matrix isn’t as famous among women as other brands. However, it has been appreciated by hairdressers and stylists. The first idea of the brand was to provide specialists with proper tools. Now, Matrix cosmetics are widely available. Biolage Exquisite Oil is an example. Matrix Biolage Exquisite Oil is designed for all hair types – even for delicate and oily strands, which is a great asset of the cosmetic. Using the product for the massage of the scalp or overnight oiling hair treatment brings numerous benefits. How does Biolage Exquisite Oil work? Matrix Exquisite Oil is a complex beautifying formula. First of all, it protects the hair from the roots to the ends so they they are less prone to damage and less sensitive to harmful external factors. Second of all, Matrix Exquisite Oil regenerates the hair from the inside; gives it strength and shine. The ingredients of Exquisite Oil Replenishing Treatment. 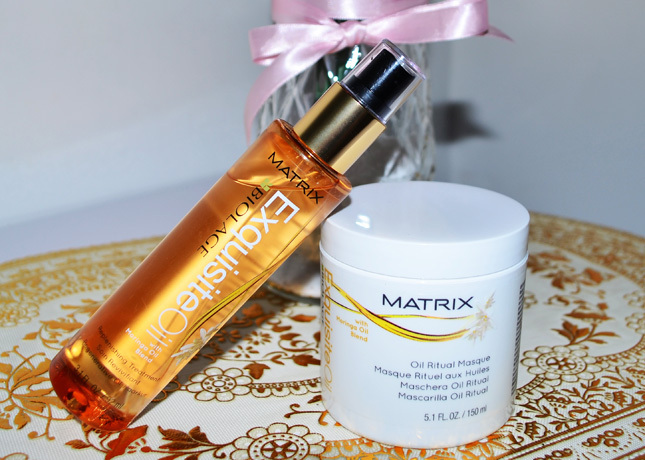 Matrix Biolage Exquisite Oil is a serum which combines three valuable oriental hair oils. (1) Moringa Oil – it is extracted from a tree which is regarded to possess magical properties. It is responsible for the regeneration of damaged and weak hair. It is able to remove toxins from cells and excellently nourishes the strands thanks to saturated and unsaturated fatty acids. (2) Macadamia Oil – it is extracted from the nuts of macadamia tree. It is one of the oils which are immediately absorbed and leave no greasy strands. It contains precious and rare omega-7 acid which controls processes on the scalp. (3) Argan Oil – known as gold of Morocco because of its beneficial properties and versatile use. It repairs even most damaged strands, rebuilds and provides complex protection from harmful external factors. Kardashian Beauty Black Seed Dry Oil is a tiny inexpensive oil.